The fall often means getting back to routine and regimented schedules after a summer of fun…and thus, no better time to also implement a routine of family meals. Why? Simply put – because family meals make families stronger! September is National Family Meals Month. Use this time to celebrate the many benefits of family meals and allow us, here at Martin’s Super Markets, to help you achieve one more family meal each week. Family meals eaten at home have been proven beneficial to the health and wellness of children and adolescents, to fighting obesity and to abstaining from substance abuse. We know that many of our families want to enjoy more meals at home together but stumble when trying to make that happen. Common battles include busy schedules, tight budgets, picky eaters, special diets and overall confusion when shopping the aisles. Luckily, that’s where I, and the rest of the Martin’s team, can help you! This year we are enlisting the help of the “Flavorful Four” to equip you with all the resources necessary to execute more healthful family meals together. 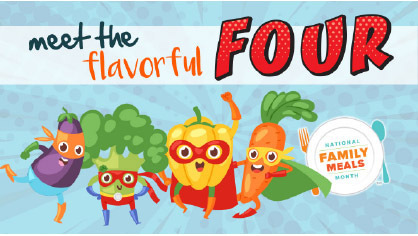 Join “Superhero Foods” Captain Carrot, Extraordinary Eggplant, Peppy Pepper and Brilliant Broccoli all month long for inspiration on executing healthful family meals. Visit our blog (www.martins-supermarkets.com/blog) to learn how to easily incorporate each of these veggies into a meal the whole family will enjoy. Tune in to our weekly ad to take advantage of savings on these items and other seasonal produce! Browse this magazine for inspiration and helpful family meal recipes. Look for the Family Meals Month logo to help you pinpoint family-friendly recipes. Share a photo of your family meal creations on Instagram by tagging @martinsmarkets and using the hashtag #familymealsmonth. Join April Howell at Martin’s School of Cooking for a special Parent/Child Cooking Class. For details and registration visit our website! ENTER TO WIN! Multiple social media contests are being conducted all throughout September where you can be entered to win a $100 Martin’s gift card! 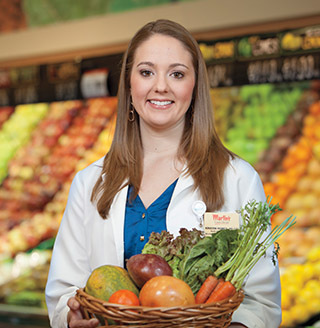 Visit both the Martin’s Super Markets and Martin’s Eat Smart Be Well Facebook pages to view contest details and to enter your submission. All Family Meals Month specific initiatives will end on Sept. 28th, 2018, however, we will continue to encourage you to create family meals all year long!